Established in 1887, in the era when spring water was associated with health, the Artesian Spring Well on the western edge of Clinton was a lively place. The Artesian Hotel catered to visiting spa enthusiasts. A race track was built and for several years the county fair was held here. Excursion trains, public buggies, carriages, and trolleys brought visitors to sample the curative, but malodorous, waters with their purgative effect on those who drank it. 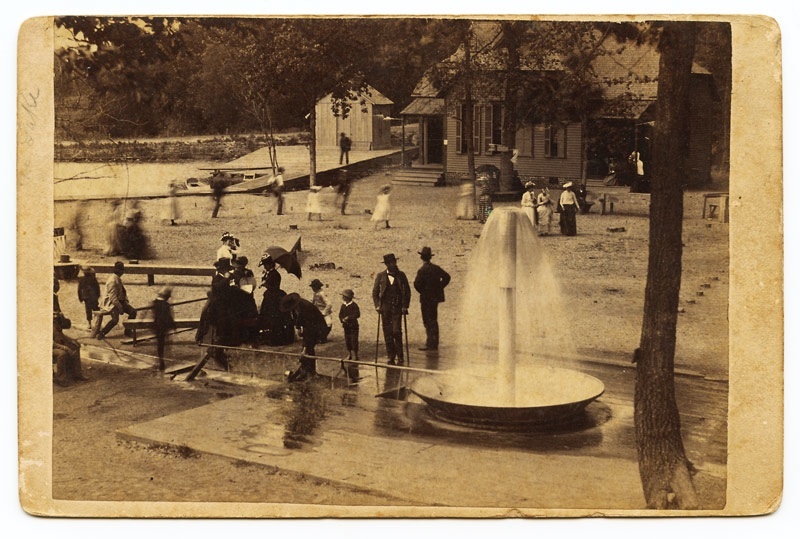 Besides the spring, which shot a fountain of water nearly 12 feet high, and lake, entertainments included a dance hall, county fairgrounds and horse racing. One and one-half miles southwest of Clinton, at the terminus of a horse-car line, are the beautiful grounds of the Artesian Park, containing a spacious lake, with hotel of three stories, basement, and attic, equipped with all modern conveniences, including dancing hall, billiard rooms and bowling alley, a pavilion, and boat and bath houses. The artesian well on the grounds discharges a palatable water, possessing known medicinal qualities, containing the chlorides of potassium, sodium, magnesium, and calcium,, the carbonates of magnesium and calcium,, sulphate of calcium, and sulhydric gas. The park is a favorite resort, and attracts visitors from considerable distances. The fountain spray subsided. Rumors circulated that a couple of local wags had dropped bowling balls into it, but more likely that the spring just lost pressure and thus its artesian effect. The original site comprised 40 acres. The bottomland area of the park became part of the Harry S. Truman Dam project. Today the site of the former artesian spring is overgrown. Elsewhere on the remaining grounds are playgrounds, tennis courts, and the Artesian Amphitheater, built in 2002 by Hilton Hotels Random Acts of Service.